I love Brazil for its vibrant culture, beautiful natural resources, fiery hot chicks, buttery waves, dope soccer, and radical music. For this post, I will discuss the latter. Music is omnipresent in Brazilian society, you hear it everywhere you go. It is very influential. I work with a guy who said he learned how to speak English by listening to Bob Marley records. I believe him, he's Rasta. Brazilians love reggae. Reggae mimics the laid back lifestyle of the Brazilian people. 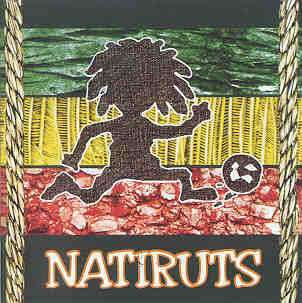 One of Brazil’s most celebrated reggae contingents goes by the moniker Natiruts (Leks-Natty Roots?). The band formed in Brasilia, Brazil’s capital, in 1996 and has been sending out irie vibrations through the atmosphere ever since. Everyone loves Natiruts. I hear people listening to or just singing their music everyday. The song “Liberdade pra dentro da cabeca” is a true reggae anthem. Whenever people hear this song they join arms and burst into a huge sing-a-long. Liberdade pra dentro da cabeca harps on a common theme music as it literally translates to: freedom inside the head. I have included both the album and live version of this jamandahalf, as the album version solidifies this as a jam and a half, the live verson shows how much people in Brazil love these guys. Liberdade pra dentro da cabeca is the first song on their debut CD, which is entitled Nativus. I must admit, it was quite a way to begin. So I can bring for me and you.